. :Stockton Decorators Merchants Ltd - Redcar branch page :. 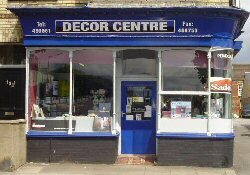 For over 25 years Redcar Decorators Merchants Ltd have traded from 102 Coatham Road which is within walking distance of the town centre. Also known as the Decor Centre, the building was formerly used as a post office and still retains many of the original features. Do not be deceived by the size of the shop area, as this store stocks a full range of top quality branded products which include Crown, Macpherson and Sadolins paints and woodstains to name a few, together with a good choice of covings and ceiling roses. The latest technology in colour mixing is available in house along wth the 'Colourzone Spectrophotometer' which makes the choice of colours available unlimited. All colour cards are provided free of charge for customers to take and peruse at their leisure. There is a good all round selection of wallpaper pattern books which are available for customers to take on loan for a period of up to five days which no charge.